Doomfist Release: His Backstory, Moves, Counters, and the Meta | Nerd Much? Doomfist is coming! That statement should not be a surprise to anyone who plays Overwatch anymore. 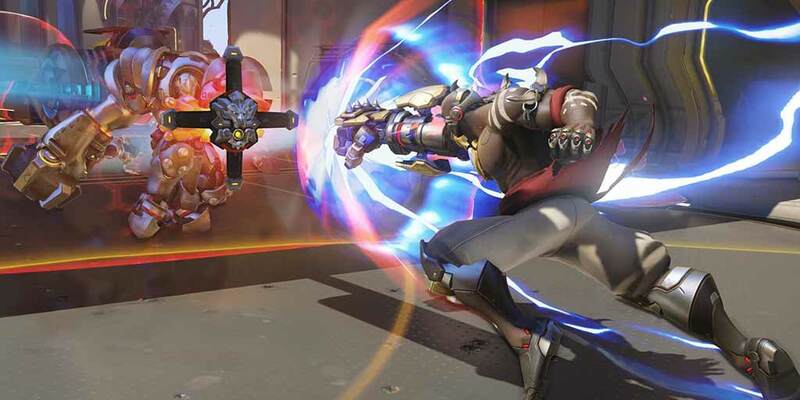 But this week, Blizzard revealed that the latest hero (or villain), the infamous and long anticipated Doomfist, will join the ranks on July 27th. After teasing us earlier this month with an awesome anime short depicting Doomfist’s capture and eventual escape, the new Talon operative is ready to join the fight. 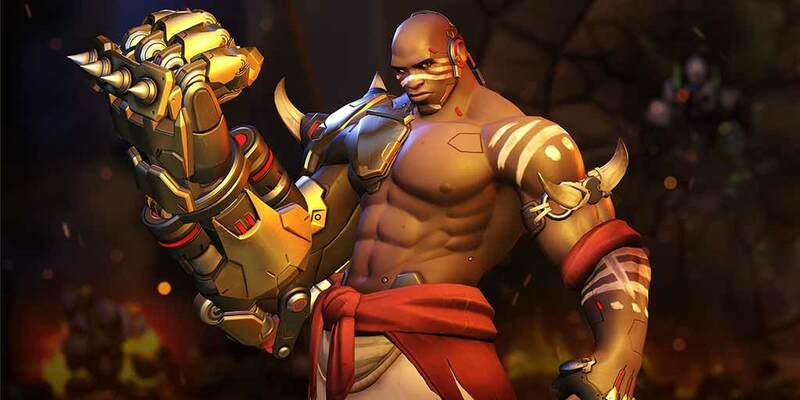 According to the game’s lore Doomfist, is a Nigerian born man who grew up in a wealthy family. His real name is Akande Ogundimu, and in his early years, he was a prominent wrestler in Africa. His right arm was lost in the “aftermath of the Omnic-Crisis”, according to his backstory on the official Overwatch website, but somehow he connects with Akinjedie Adeyemi, the Second Doomfist (better known as the Scourge of Numbani). The Scourge introduces Ogundimu to the Talon Organization. From there, we know Ogundimu kills his mentor, takes the Doomfist and is eventually defeated in battle by Overwatch forces including Winston, Genji and Tracer. He’s locked up until his most recent escape where he smashed a bunch of OR-15s in Numbani airport and seized the powerful gauntlet from its protective casing. Now that we are up to date on his backstory, let’s take a loot at how this new character is going to play when he launches next Thursday. 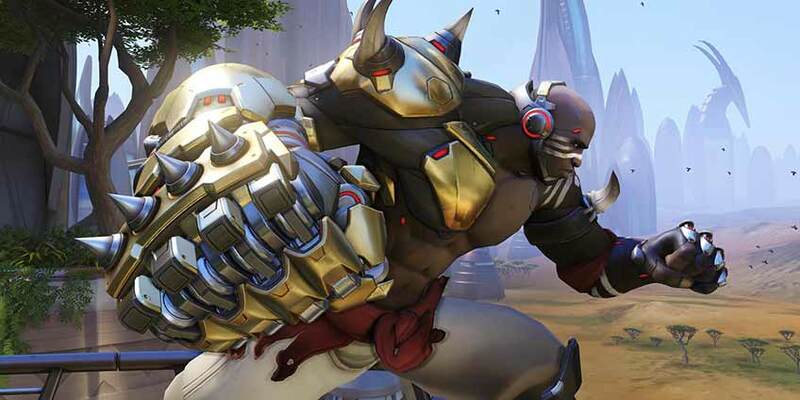 The most striking thing about Doomfist is, well, the Doomfist, itself — his huge, spiky, powerful right arm. With this massive arm he has three main abilities, Rocket Punch, Seismic Slam, and Uppercut. Rocket Punch will send enemies hurtling into walls where they will receive subsequent damage (and a pretty cool imprint on the map). Just imagine doing to your opponent what he did to that poor OR-15 who is forever stuck in the wall of Numbani Airport. Rocket Punch can also stop a charging Reinhardt in his tracks. Seismic Slam and Uppercut are both up front close range attacks using the Doomfist. Seismic Slam knocks down nearby opponents and Uppercut sends your enemies flying, hopefully off the map for some epic environmental kills. When he’s not attacking at close range, Doomfist can use his hand cannon to deal damage from longer ranges. You could soften your targets up with the hand cannon and then charge in with Rocket Punch. Not to mention Meteor Strike, Doomfist’s ultimate attack that sends the character flying into the air, only to smash back down to earth and wreak devastation upon anyone nearby. Meteor Strike has little to no warning for those being attacked, so when you see Doomfist shoot up into the air like some kind of African Superman, take cover and pray. When Doomfist was first released and the details of his abilities came out, I thought, this guy is going to be powerful but he will get destroyed without support from a healer. If you’re constantly charging in and out of enemy groups without anything supplementing your health, your gonna go down pretty quickly. But Doomfist has another trick up his sleeve: he generates a shield whenever he does damage with his abilities (not too different from Reaper gaining health from the damage he applies). So, with that knowledge we now may have an “Over-Powered” or OP character on our hands. (Close your eyes and just imagine if Genji had someway to regenerate his health on his own). A heavy-hitting, frontline attack player that regenerates his health through his abilities is going to be one hell of an asset for any team. Like Genji, who also thrives off diving into enemy formations and disrupting them with his unique weapons and abilities before double jumping away, Doomfist is going to be a get in, get out type of player and will probably leave a few bodies lying around before he is all done. But since he is a brand new character, I doubt we will see his impact on the meta right away. Orisa, the newest character prior to Doomfist joining the game, took time for players to get used to. Orisa was a pariah for the first few weeks and teams would shun players that selected her for battle. Now, she is arguably the best choice for a defensive tank. Doomfist’s impact will be huge as players skill up with him, but it won’t be immediately. Since Doomfist relies heavily on his abilities as opposed to his main attack, the hand cannon, its going to take a lot of precise timing to be effective. Managing the abilities and their recharges is going to be key. If you Rocket Punch your way through the enemy’s line but don’t have any abilities available like Seismic Shock or Uppercut, you are probably going to get mowed down. A combination of his abilities will keep your shields up while the enemy around you pays for it, and then just as they are recovering, you can Rocket Punch your way back to safety. Also, tanks like Reinhardt and Orisa that are pretty much stationary behind their barriers, are going to need to pay attention when a Doomfist is on the field. Once you Rocket Punch through those barriers those two popular tanks are going to have some decisions to make. Sacrifice the security and protection of their barriers, or allow Doomfist to face punch them to death. From what I have seen so far (all on PTR), the best counter to a Doomfist right now, is a Bastion. Bastion (one of my favorite characters, by the way) is an effective counter against almost anyone. 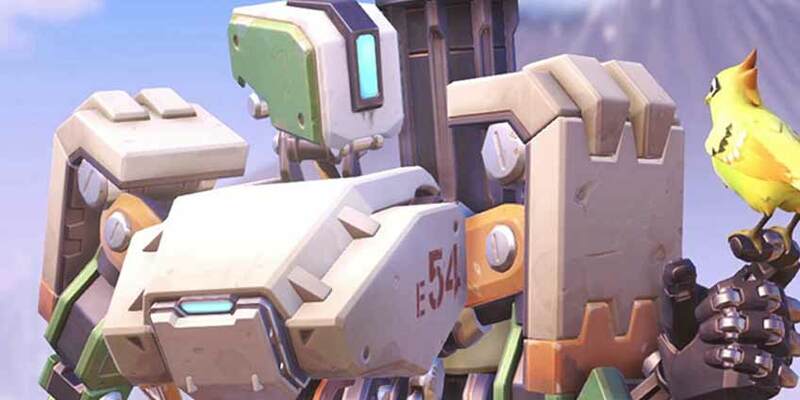 While Doomfist is storming in with a Rocket Punch, Bastion’s steady stream of deadly bullets will chew down his shield and health. Also, from turret mode, Bastion is not prone to the displacement caused by the Uppercut. So a well placed Bastion could cause trouble for our hero/villain from Nigeria. Similar to Bastion, Soldier 76 can put a lot of damage down on targets and might be another viable counter. The only difference, is that the Uppercut is going to send Soldier into the stratosphere while Bastion is still clinging to the surface for dear life. And, let’s not forget about Sombra. Her hacking ability will nullify all of Doomfist’s abilities leaving him incredibly vulnerable. Since his abilities don’t just deal damage but also raise his health, disabling his abilities will be a death sentence. These are just some of my initial thoughts on Doomfist. Only after July 27th will we truly know how he is going to play and impact the game. It’s a tricky business introducing a new character into, in this author’s opinion, one of the most balanced team-based fighting games ever created. Blizzard has made introducing new characters a fine art, or maybe its a fine science. Either way I’m confident that Doomfist will fit in seamlessly but there are always questions. Are they going to be overpowered, or simply irrelevant? Are they going to be everyone’s first choice, or ignored? So we shall see, will this new Doomfist, the Successor, be more Scourge or Savior? Let me know what you think Doomfist’s impact will be on the game? How will he fit into competitive matches? Do you see yourself maining Doomfist? Are you, like me, disappointed the new hero wasn’t a jet pack cat? What do you think his weaknesses are going to be? Who might be an effective counter for Doomfist? Share your thoughts and comments below. Edward Kolnaski is a History and Social Studies teacher who never really grew up. He loves games of all genres, from current titles like Overwatch, to classic RPGs like Final Fantasy VII. Once the snow starts falling you can catch Ed at one of the local mountains shredding some pow.